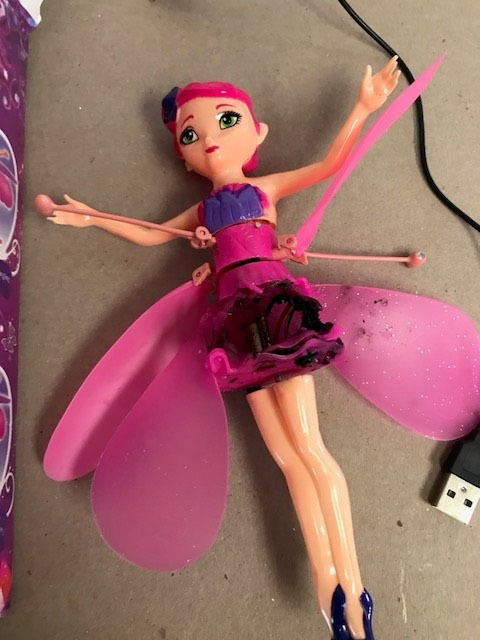 The Troubleshooter looks into reports the Flying Fairy toy may be a fire hazard. It was supposed to be a Christmas gift for her granddaughter. Instead, Beth Banes says it caught on fire before she could even give it to her. "She just blew up," Beth said. "There was no pre-warning of something smelling hot; I saw no smoke - just erupted into flames." The toy in question is called the Beautiful Flying Fairy. Beth ordered the toy from Amazon. "It didn't come in time for Christmas, but it did come last week," she said. "I thought I'll go ahead and take it out of the package and charge it up and thank God I did." Beth followed the instructions on the box and plugged it into her computer to charge. "In less than two minutes she erupted into flames at my desk. I promptly pulled the plug out of my computer and ran out into the loading dock and dropped her on the concrete," Beth recalled. Beth Banes' Flying Fairy burst into flames. Beth isn't alone. Brooke Osbeck from Michigan bought two of the Beautiful Flying Fairys, also from Amazon. 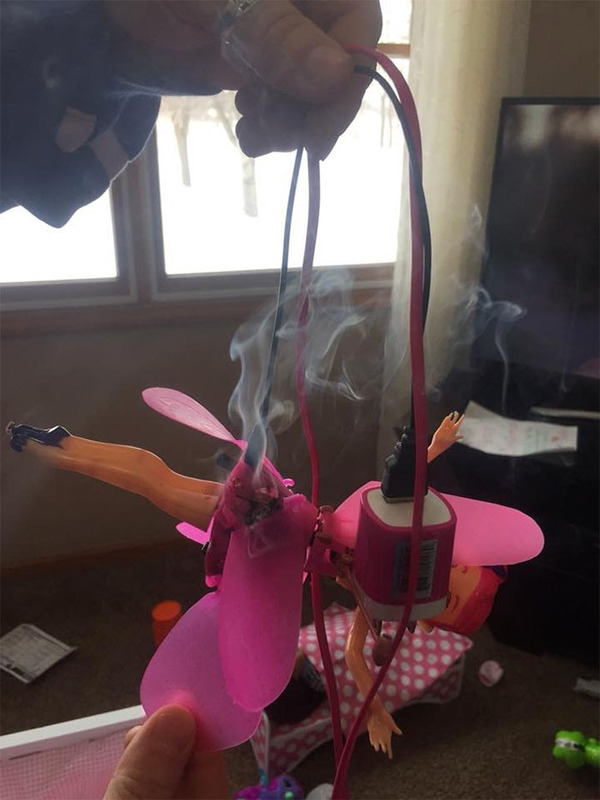 Brooke said that while one was charging, it started smoking. Brooke reported it to the seller on Amazon, TYZEST and wrote a review about what she says happened. Through email, the seller did offer Brooke a refund or a new fairy. They also asked her to delete her bad comments. Brooke declined to do that. Beth did contact Amazon about the incident and was given a full refund. She said she's surprised even after reporting it Amazon that she could still buy it from the seller, TYZEST. Smoke can be seen coming from Brooke Osbeck's Flying Fairy. "I was really concerned this could happen to someone else that wouldn't be sitting right in front of it when it happened so I decided to contact you," Beth said. I contacted Amazon, and now the Beautiful Flying Fairy is no longer for sale by TYZEST. Amazon also reached out to both Beth and Brooke with a full refund of the product. A spokesperson adds, "Customer safety is among our highest priorities. We monitor the products sold on our website for product safety concerns, and when appropriate, we remove a product from the website, reach out to sellers, manufacturers and government agencies for additional information or take other actions. If customers have concerns about items they've purchased, we encourage them to contact our Customer Service directly so we can investigate and take appropriate action." I have not heard back from the seller TYZEST. The product is made in China and nowhere on the packaging does it say who manufacturers it. I was able to find this toy for sale on several other third-party websites, walmart.com, and through other sellers on Amazon.